This week we will profile the first of two global Property ETFs. It is also the third and final ETF from the CoreShares stable. 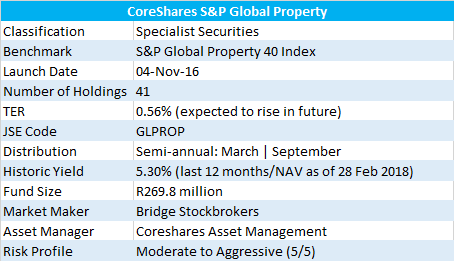 Almost a year ago (18 April 2017), I penned an article on the CoreShares S&P Global Property ETF to bring to the attention of Sharenet’s readers the new opportunity to invest in global listed REITs via a JSE-listed product. The ETF is still in its infancy having only launched in November 2016, but already boasts almost R270 million in assets under management. The CoreShares S&P Global Property ETF tracks the S&P Global Property 40 index, an international listed real-estate index made up of the 40 largest (by float-adjusted market capitalisation) property shares spanning the globe. The fund construction process applies additional filters to take into account liquidity requirements, and only adds underlying shares that trade on developed and well-regulated stock markets. The index construction methodology is expanded to incorporate additional filters that are applied to ensure that the 40 stocks chosen meet liquidity requirements of the index managers. Further, to be included in the fund, the share must be a dividend-payer, and positive earnings in the most recent financial period are a non-negotiable prerequisite. Finally, if applicable, a maximum weighting cap of 10% is applied to manage risk of overexposure in the portfolio. 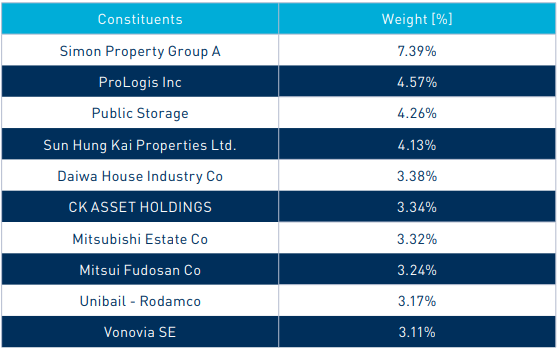 The last point is illustrated in the following table which takes a look at the CoreShares Global Property ETF’s sector weighting as of 28 February 2018. 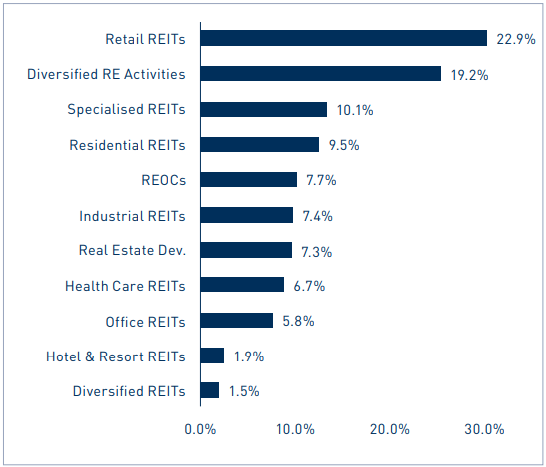 The South African listed-property market is predominantly focused on retail, office and industrial REITs with one storage REIT added to the mix relatively recently. However, overseas there are 17 different sub-sectors of real estate investment. The investor is now able to tap into these additional opportunities. 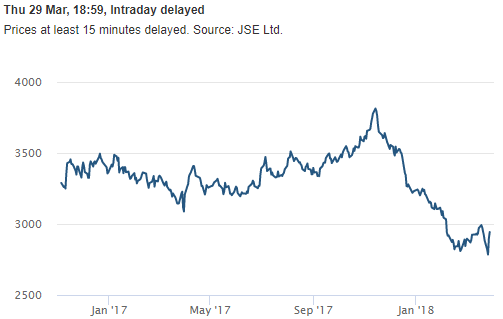 Investors should note that the portfolio invests in markets which keep different trading hours to South Africa, and this can from time to time affect pricing of currencies as well as that of the underlying instruments held in the portfolio, which in turn also impacts tracking error between the portfolio and the index. The performance presented in the table below is converted into rands and has thus suffered from rand strength over the last +12 months. In USD terms for example, the index is actually positive over the "since inception" period, having moved up approximately 1%. Hardly a return to get excited about. Uunfortunately that is illustrative of the performance in the property space over the last year or two.